In a time when mixed martial arts is in dire need of some good news involving performance-enhancing drug abuse, Nevada Athletic Commission executive director Keith Kizer offered some up on Friday. The random drug tests they administered on UFC stars Shane Carwin (Pictured) and Roy Nelson ahead of their December 15th scrap have come back clean. 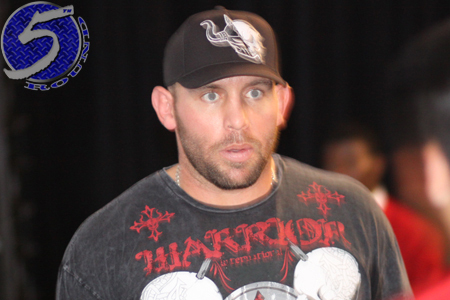 Carwin was examined on October 18th, while Nelson was screened the following day. According to Kizer, both samples were submitted to LabCorp. Each heavyweight was tested for steroids and diuretics, but not for recreational drugs such as marijuana and cocaine. Kizer did not disclose why the NSAC didn’t scan for recreational substances. Neither of the competitors have flunked drug exams in the past. The former interim heavyweight champ and Nelson were serving as opposing coaches on “The Ultimate Fighter 16.” The bitter rivals will collide in the show’s finale. The Joint at the Hard Rock Hotel in Las Vegas, Nevada hosts the shootout.